Many Indian homes and bulk kitchens (like weddings) use aluminium vessels for cooking, one of reasons being that the thermal conductivity of aluminium is extremely good. Is there a danger of using them for cooking? Yes and No. Yes, aluminium vessels can pose danger to our health if cooked food is left for long in them or if the vessel is exposed to heat excessively. But if food is cooked in a clean aluminium vessel and transferred immediately into a stainless or glass container, there's not much harm done. The longer the food is left in the aluminium vessel, the greater the chance of aluminium being absorbed into the food and the metal going into our body. Aluminium absorption by the food is much higher if the food has an acidic medium (egs - tamarind, lemon). Curdling milk in an aluminium vessel also ups the metal content in the end product. 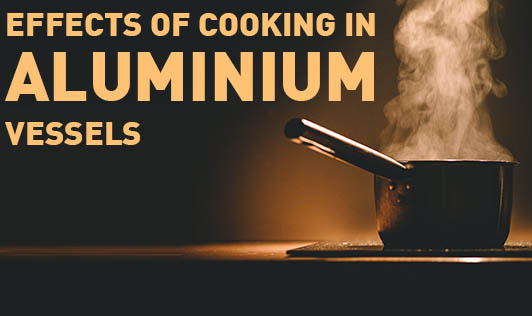 Some people believe that using aluminium vessels for cooking can lead to gastrointestinal disturbances, headache, softening of the bones or alzheimer's disease. Most of these beliefs have not been substantiated adequately. It would perhaps take high doses of aluminium absorption for such effects to manifest. Anodised aluminium vessels are said to be safer for use as compared to the regular aluminium vessels.